Product prices and availability are accurate as of 2019-04-10 23:44:25 EDT and are subject to change. Any price and availability information displayed on http://www.amazon.com/ at the time of purchase will apply to the purchase of this product. 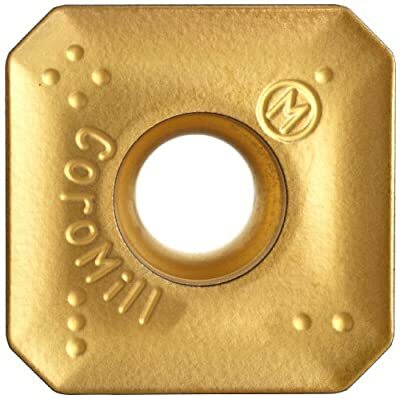 From roughing to finishing, the CoroMill 245 is the first choice for face milling of most materials with an emphasis on general face milling (light to heavy) of cast iron and steel. Because of the CoroMilll 245's unique design, it has: More positive geometries with improved edge strength. Stronger geometries with lower power consumption. L/M/H geometries designed for different feed areas-not only edge strength. Long, consistent, and predictable tool life. Smooth and light cutting action. Enhanced corner designs to reduce burr formation and frittering of component. New design of parallel land improves surface finish on L and M geometries. Improved effeciency due to design by application. Operations: General face milling. Face milling to mirror finish. Chamfering (true 45° angle). Demanding intermittent machining. Machining with long overhang. Turnmilling.